Adventure World Links, Cheats And Tips Guide: Coming tomorrow: Indiana Jones in Adventure World!!! Coming tomorrow: Indiana Jones in Adventure World!!! 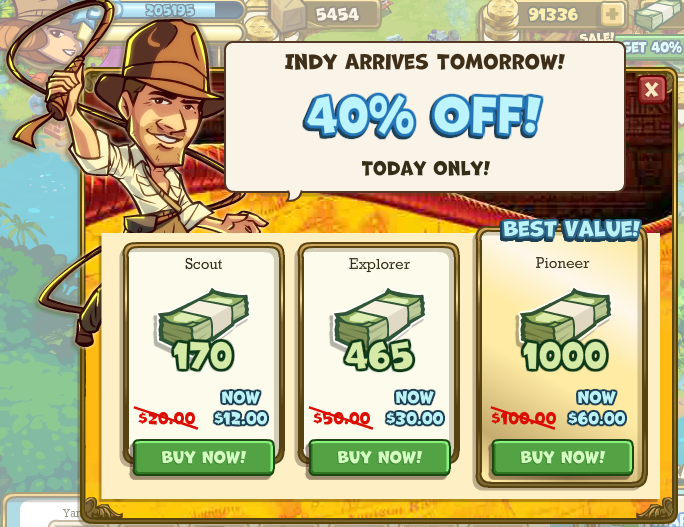 Note: Receive up to 40% off of your Adventure Cash purchase on Cyber Monday! You have received hints of Indy joining you in Adventure World since Zinga launched in September. He already sent you a few letters with updates on his status. In those letters, we last heard that his plane mysteriously went down near Cuba. At that time, he asked Zoey to assist you in crafting new Gadgets for you to use against beasties. Well, now the wait is almost over! Starting tomorrow, Indy will join you in Adventure World. Join Indy to South American Jungle to find an important Standing Stone. This stone contains information on a mysterious artifact known as the Calendar of the Sun. The artifact was supposedly constructed to control eclipses. It seems that others have beaten you to the punch though, and we are not talking about friendly individuals either. This will be the first of many appearances that Indiana Jones will make within Adventure World. While he may not join you for every map or quest, his presence will be felt throughout all of your Adventures. From visual representations to the actual Gadgets he has used, you will soon notice many new and exciting enhancements within Adventure World.